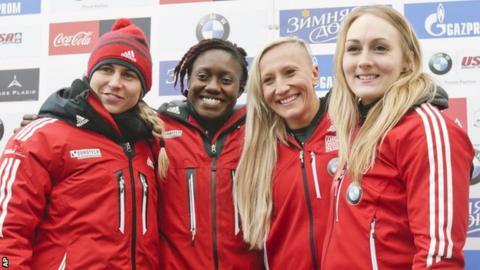 Canada's Kaillie Humphries made history as she drove the first all-female sled against male competitors in a four-person World Cup event. Humphries - with crew-mates Cynthia Appiah, Genevieve Thibault and Melissa Lotholz - finished 17th and last in the first of two runs at Lake Placid. The two-time Olympic champion was 2.5 seconds behind the lead held by Germany's Maximilian Arndt. "To be the first one is cool, but I'm not doing it to be first," she said. "I'm doing it because it challenges myself to be a better pilot, to have something else to look forward to, something fun." Women have only a two-person division now, but Humphries is hoping to see a four-woman division added before her competitive career is over. Humphries and American pilot Elana Meyers Taylor raced against men last season, but only with men as their team-mates. The second run is later on Saturday.